Take those spring veggies in your CSA box and turn them into something spectacular! 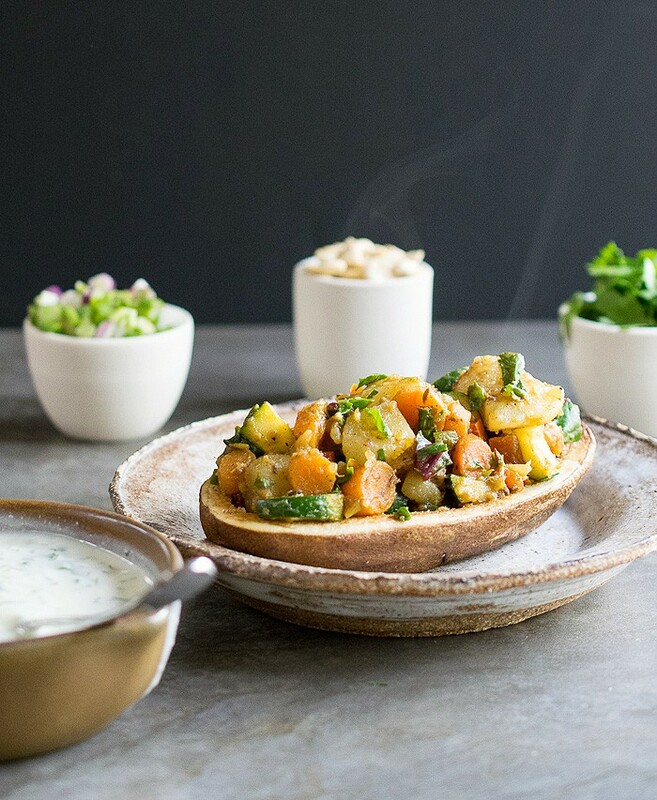 For this Instant Pot Vegan Curried Spring Vegetable Potato Chaat, we cook the veggie curry in the Instant Pot while the potatoes cook in the oven. This is another post in my series of recipes sponsored by the Idaho Potato Commission. You can never have too many recipes for potatoes and this is one that will really impress your guests. You could also partially cook the potatoes in your Instant Pot and finish them in the oven to crisp up the skins. 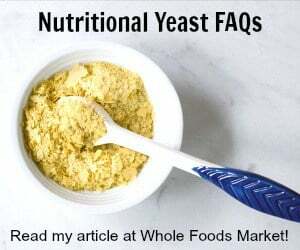 I even made my soy yogurt in my Instant Pot, and the recipe will be in my new cookbook! The spring vegetable mix includes the delicious inside of the potato mixed with carrots, zucchini, and my spring favorite, rainbow chard. If you aren’t a huge curry fan still give this a try. It’s lightly spiced and is a great gateway into trying more Indian goodies. This is a colorful recipe that’s perfect for a main course, but you could use Idaho® small red, gold, or fingerling potatoes and make little one-bite appetizers. Preheat the oven to 425 degrees and prepare 2 baking sheets by covering with parchment paper. Heat the oil in your Instant Pot on the saute setting. Once hot add the garam masala, cumin seeds, turmeric, mustard powder, and cinnamon. Saute until the spices become fragrant, about 1 minute. Add in carrots and water. Put the lid on and close the pressure value. Cook on high pressure for 5 minutes. Carefully release the pressure manually by moving the value to vent. Remove the lid and add the zucchini and potato. Change the setting back to saute. If it starts to stick to the pan, add another ½ cup water. Once the zucchini are tender stir in the chopped rainbow chard and cook another minute. Salt to taste, before adding to the potato skins. As the weather gets warmer, you’ll find even more reasons to pull out your Instant Pot or slow cooker. Both keep your kitchen cool and put dinner on the table without as much hands on time. Yes I have an Instant Pot and it’s all your fault! THANK YOU!!! Looking forward to your new book. I’m missing the part where you use the Instant Pot. Whoops! I put the non-IP version up. I’ll fix that now! And thanks for letting me know. My brain is stretched more thin than ever! Is there a reason you don’t cook potatoes in the IP? Maybe the shell wouldn’t hold up? I wanted to make sure there was a crispy skin on the potatoes. However, you could cook them whole, on a rack over 1 1/2 cups water in your IP for 15 minutes on high pressure and release the pressure manually by opening the valve. Then cut in half and finish in the oven for about 10 to 20 minutes. This sounds fantastic Kathy! Check out all those wonderful flavors!!! Can I just say I want to pull a chair right up to your table. Everything looks so beautiful and love all the ingredients. Winner! OH, yes, I’m always looking for more recipes for my Instant Pot! This looks so good! I LOVE chat! What a wonderful twist and idea! I love that they are served inside the potato too! Thanks for the recipe! I bet your book will be a major success Kathy! Just like this amazing looking recipe! This looks fabulous ! 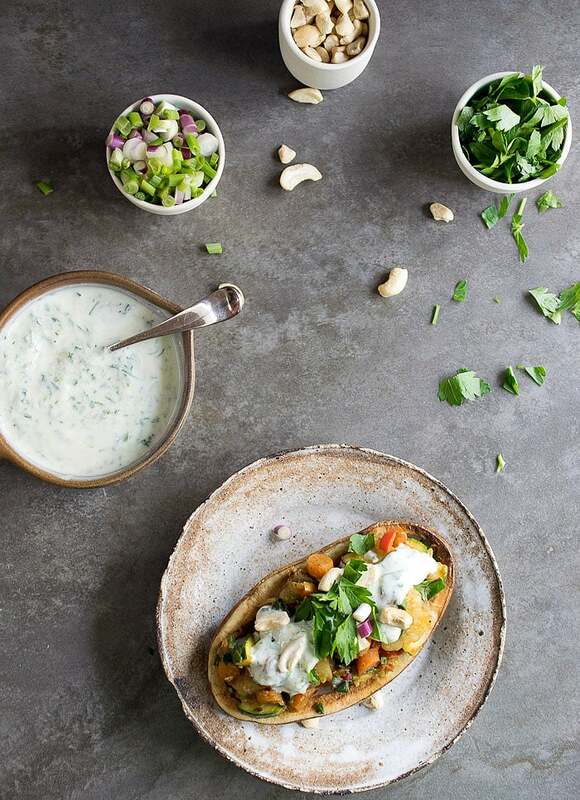 Potato chaat makes me hungry now! 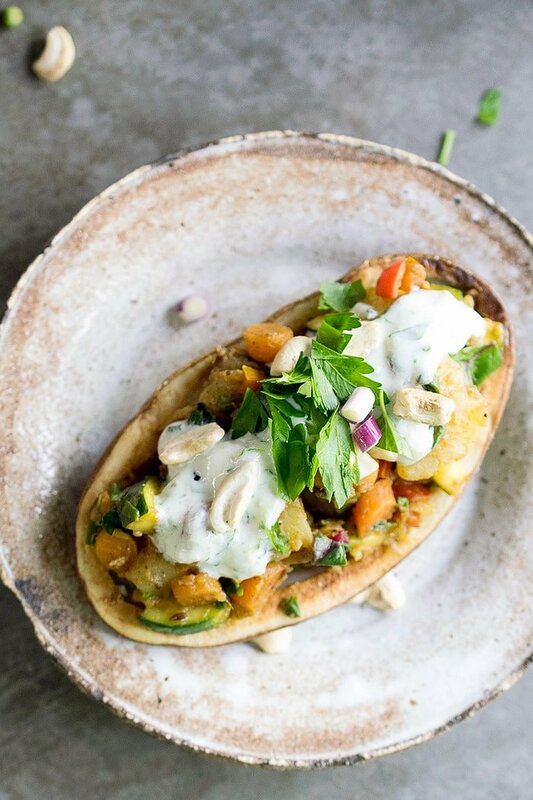 i love chaat in general and im absolutely loving this idea with all the spring veggies! This sounds delicious Kathy, and your pics are stunning! Those are beautiful!! The pics make them look so amazing, great shots! I love pretty much anything in a potato! I really like these one pot vegan meals. Making it curried is even better. What a delicious combination of ingredients and spices. Your presentation is out of this world! It looks amazing. My kids like potato chips and chaat. I’d love to try this at home. Could you put up the non instant pot recipe again? I don’t have an instant pot. I made this recipe before without it. Just cook the veggies on the stove instead of the Instant Pot. You may need to add a little more liquid, but that’s it.